Help us Create the World’s Biggest Bird Feeder! The coldest winter in 49 years has led to the die-off of one of the most important food sources in the reserve, clams. Some of our birds are there and some are on their way. It's a 10,000 km non-stop flight in which they will lose nearly half their body weight. The reduced food supply means there is going to be a lot of competition. The majority of NZ's godwits use this site, feeding on some shellfish, but also worms. 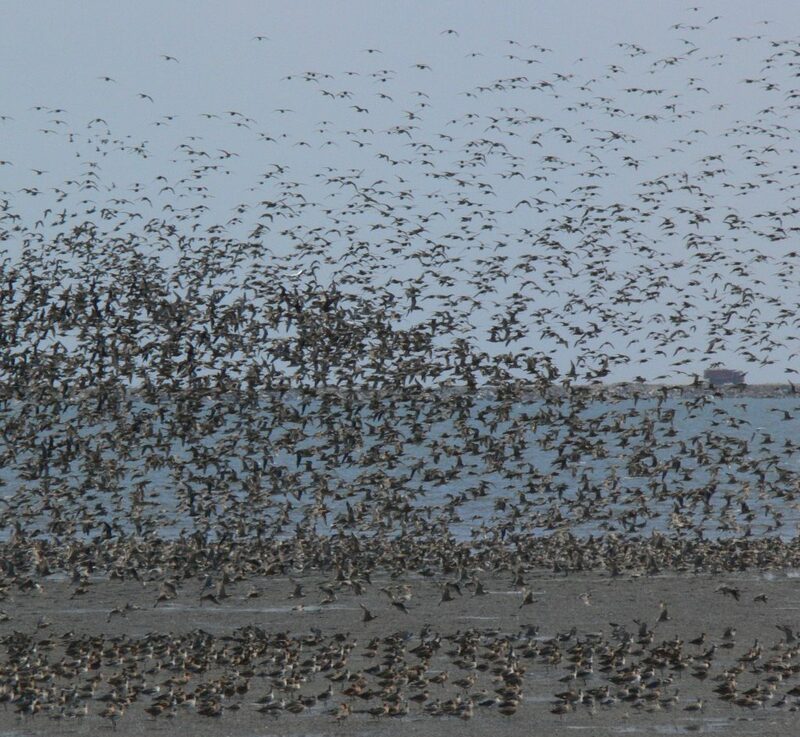 25% of the global great knot population uses the mudflats and rely almost entirely on shellfish for food. Yalu Jiang is an internationally important site for 15 species of shorebirds. They are all going to be hungry this year. A bird feeder. A bird feeder kilometers long and wide, with farmed shellfish dropped over the mudflats to feed the birds. As well as saving the birds this year, we can also learn so much about providing safety nets for them. The mudflats of the Yellow Sea are being destroyed through reclamation and, increasingly more common, extreme weather events. This year we can learn new techniques to manage these migratory birds. What's the real impact if we don't fix this? For godwits we aren't quite sure yet. We would	expect the population to decline - 5%? 10%? It will really depend on what those 70,000 - 80,000 great knots do when there aren't shellfish to eat. Will the great knots start to eat the godwits food sources? We do know that there will be a larger impact on the endangered great knots. We're worried their population will drop by more than 10% in just 2 months. The team at Yalu Jiang have told us they have a programme set up to work within the funds raised so far, so we won’t be raising any more funds. thank you so much to everyone who has contributed. We’ll wait two weeks to determine if there are some funds that were not used, and if so we’ll be in touch with people about returning any unused funds. Our main English speaking contact in the area has just gone in to North Korea for 10 days, so unfortunately we don’t have any real updates yet! We’ll be in touch. The SEE foundation have donated 500,000RMB, State Forestry China have also donated 500,000RMB. That’s the first million from the RMB 2.68 million (US 425k). The project is therefore a “GO”. It scales up from here. What happens to your donation? PMNT is collecting donations in NZ, we'll pass them through Hong Kong Birdwatching Society, a Birdlife International Partner. No organisation will be taking overhead costs but any fees and and taxes will be deducted. An intial donation of over $100,000 NZ dollars has been received from the SEE Foundation, China. It's enough that we can confirm the project will go ahead. It scales up from here - so every dollar counts. PMNT has been working at Yalu Jiang since 2000 and we've been in the flyway for longer. A summary of our work in the flyway is here. We've published a report on ten years of shorebird surveys at Yalu Jiang. Food shortages really do cause population declines. Here's what's happening right now with red knots in the american flyway.